Coloring like you haven’t seen it before — perfect for colored pencils or crayons! 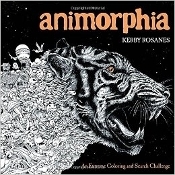 An amazing coloring book for adults featuring the super-detailed animal images from artist Kerby Rosanes. Known for his popular Sketchy Stories blog, Kerby works in intricately detailed black and white line to create creatures, characters, patterns, and tiny elements to form compositions of mind-boggling complexity. Bring your creativity to complete the breath-taking drawings and find hidden treasures and creatures scattered throughout its pages.